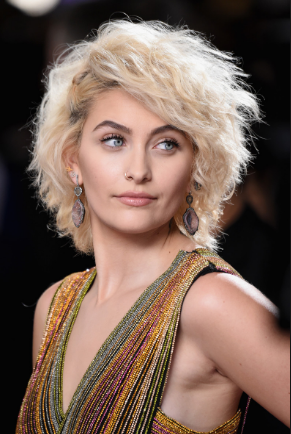 Paris Jackson as we know is a singer, an actor and a performer. To top it all she is the daughter of the Biggest Dance icon of the world, Michael Jackson. Paris has always been really fond of tattoos. Let’s have a look. Paris has got chakras inked on her front as well as back. She believes these chakras give her the energy and has followed her godfather, Macaulay Culkin in doing so. The tattoo appears in the most painful spot in the center of her chest starting from sternum to the belly button, ending just above it. 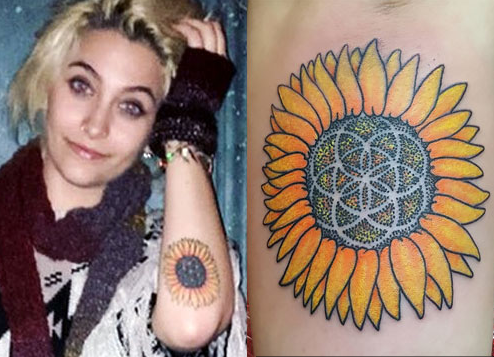 Paris Jackson has got a large sunflower inked on her left forearm by the tattoo artist Justin Lewis in October 2016. 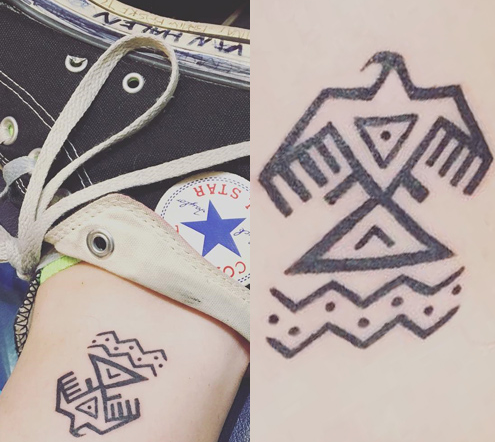 Paris Jackson has got the title of musician Butch Walker’s Fifth album, “I Liked It Better When You Had No Heart” inked on the right side of her ribcage. The tattoo is preceded by a dead bird. The album was released under the name of Butch Walker and the Widows in February 2010. Paris has another tribute inked on her body. This time she paid tribute to The Beatles’ John Lennon by getting the lyrics, “Imagine All The People Living Life In Peace” of his solo, “Imagine” inked on her left arm. 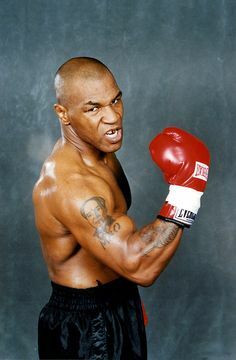 The ink-work was done by the tattoo artist Connor Garrity in September 2016. 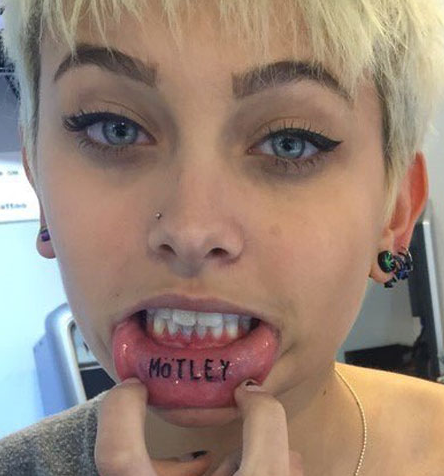 Paris Jackson took a step further in paying tributes by getting her lower inner lip inked, “MOTLEY” in April 2016. This came as a tribute to her favorite band MOTLEY CRUE which she has been following since her childhood. 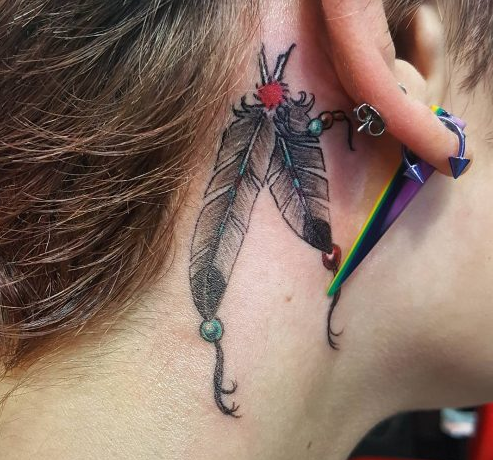 The tattoo-loving teen has another one on the back of her right arm. This tattoo was also inked by Connor Garrity in May 2016. In the tattoo, a stag is shown with an arrow piercing a heart between the antlers. This was the first tattoo done by Connor Garrity on her. Jackson has another tattoo which shows Frank the Rabbit Mask from the movie “Donny Darko” along with words “Wake Up” below it on her right forearm. The rabbit is inked in grey-scale whereas the background has been given blue splatters in the tattoo. 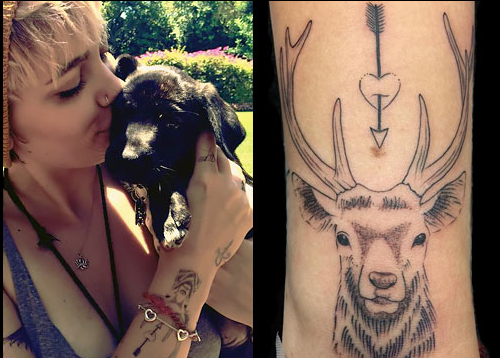 Paris Jackson got wolf inked on her left forearm. She got this tattoo done by Connor Garrity in May 2016. After all the tributes she has given by her tattoos, the biggest of them all came in May 2016. She got this design inked by tattoo artist Justin Lewis, which was taken from the cover of MJ’s iconic 1991 album Dangerous which was designed by Mark Rhyden. The tattoo features the menagerie of animals just like it was on the album with MJ’s eyes at the center with a curl of his hair in between the eyes. Paris has a tattoo of a cactus and the name of her pet “koa’ in cursives which is a rescued pit bull mix. 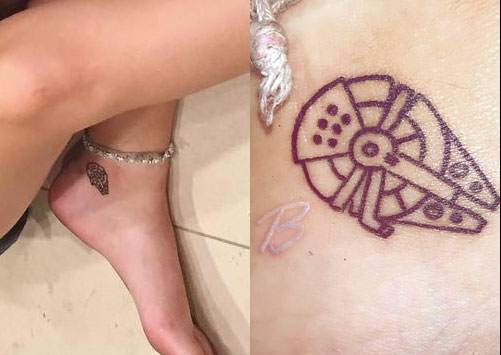 Paris Jackson has a letter “B” tattooed in white ink on her left ankle. B is the initial for her younger brother Bigi (Blanket) Jackson. This is followed by a tattoo of Millennium Falcon spaceship from the Star Wars movies done in black ink. Paris got her boyfriend’s name “SNODDY’ inked on the outside of her left ankle, who is a drummer in Street Drum Corps. How she got it covered by an artistic cactus design after their break-up. 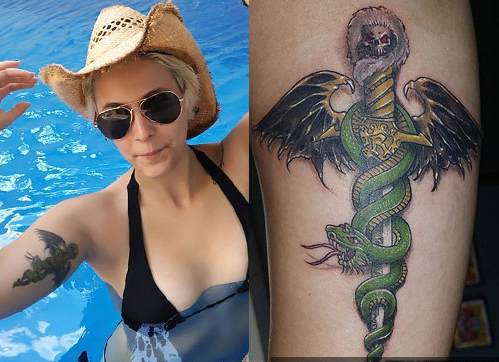 Paris Jackson along with her boyfriend Snoddy have got a matching tattoo on her right ankle of a skull with three mini crosses on the top. 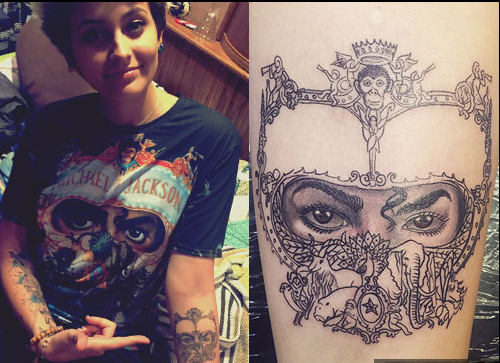 Paris Jackson a tattoo of “veve” of Erzulie, which according to Haitian Voduo is the spirit of Goddess of love. Its symbols are a heart, a mirror and a fan, which is quite visible in the tattoo on Jackson’s arm. Erzulie is considered as the symbol of feminine grace and beauty and is taken as the most human relatable spirit or The Loa as it is known in Haitian mythology. Such is the fan nature of Paris Jackson that she didn’t stop after getting MOTLEY inscribed on her inner lip. She got a tattoo of a dagger which has a snake swirling around it with wings on the side and a skull on the top. This tattoo is taken from the cover of Motley Crue’s album Dr. Feelgood released in 1989. 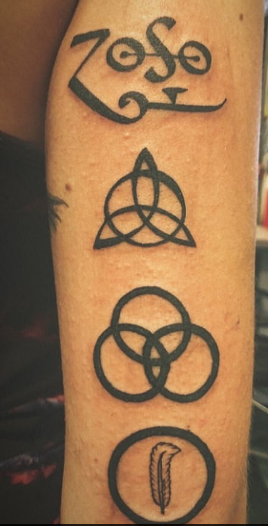 Paris Jackson took to the social media to show off her latest tattoos inspired from the band Led Zeppelin. It has four symbols which were used by the band to promote their fourth album, Led Zeppelin IV released in 1971.